Oze National Park, located in the Kanto region of Japan, is one of over 30 national parks in the country. 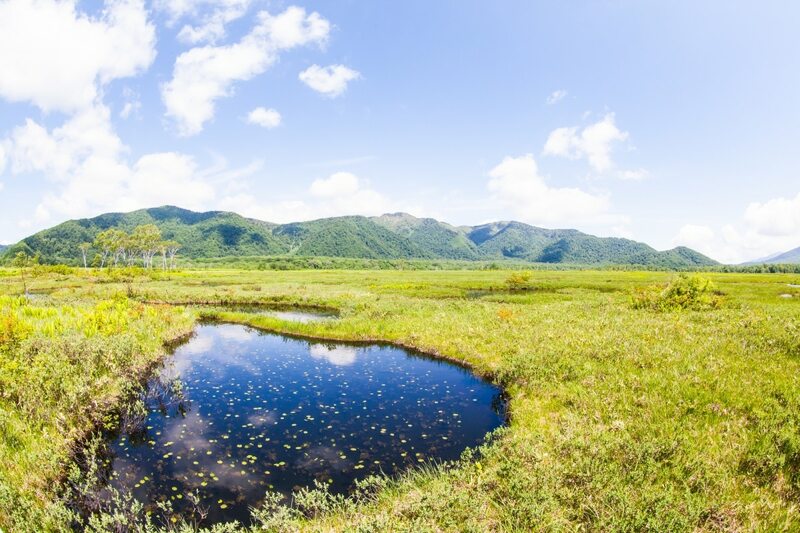 With hiking trails that crisscross extensive wetlands and are encircled by mountains, its stunning scenery and well-maintained paths make it a popular destination with hikers and nature lovers alike! Located in a mountainous region about 150 kilometers (about 93 miles) north of Tokyo, Oze National Park actually spans four different prefectures of Japan. Most of the park is located within Fukushima and Gunma, but parts of its 37,200-hectare area also extend into Niigata and Tochigi prefectures as well. It was originally part of Nikko National Park, but in 2007 received separate designation as Japan’s 29th national park in combination with nearby mountains, including Mount Tashiro and Mount Taishaku. One of Oze’s most popular features is the Ozegahara Marshland. Approximately one kilometer long and six kilometers wide (about .5 miles by 4 miles), it is made up of hundreds of distinct, tiny pools. Access is provided via elevated wooden boardwalks that run across the marsh. There’s also a visitor center where you can learn more about the formation of the wetlands, as well as the plants and animals that live there. Another well-known attraction is Lake Ozenuma, which was originally formed after a volcanic eruption in the area. A six-kilometer path takes hikers around the entire lake, enabling you to enjoy the surrounding flowers and nearby forest. Due to the relatively flat landscape and well-maintained trails, hiking in Oze is accessible for most hikers, regardless of experience level. Multi-day hikes and treks to the summits of some of the surrounding peaks are also available for those who want more of a challenge. 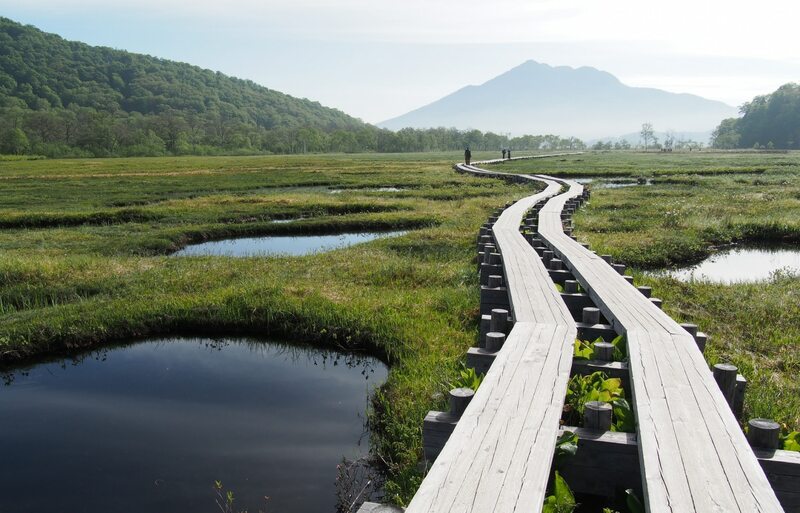 Other notable features of Oze include the spectacular 100-meter (about 328 feet) Sanjo-no-Taki waterfall, and Mount Hiuchigatake, the highest stratovolcano in Tohoku. In addition, Oze is home to unique ecosystem of flora and fauna protected by 2005 Ramsar Convention, an intergovernmental treaty to maintain the ecological character of wetlands. Oze is normally open from mid-May until late October, with each season bringing its own special features and highlights. Snow lingers in May, before giving way to the flowering skunk cabbages in early June. The blooming of these white flowers all across the marshland is one of the area’s most famous sights. After this, in late July and early August the park is carpeted with beautiful yellow alpine lilies. Towards the end of September and in early October, autumn arrives, turning the marsh grass to gold as the leaves of the surrounding mountain trees change to fiery red. Oze National Park has two main access points: one on the north side in Fukushima, and one in Gunma to the south. From Tokyo, you can either take the JR Joetsu Shinkansen to Jomo-Kogen Station, or transfer at Takasaki and take a local train to Numata Station. Shuttle buses run from both stations to the park. Alternatively, direct buses from Shinjuku Station run three times a day during Oze’s open season, and a one-way trip takes about four hours. While it’s possible to visit the park on a day trip, accommodation is also available in mountain lodges and camping grounds to help visitors make the most of their time. There's more than a single day of scenery to see, so staying overnight is a great way to explore more of the park! For more information, visit National Parks of Japan.